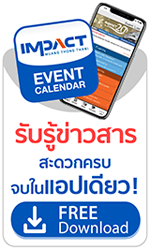 IMPACT is the preferred destination in Thailand for Impactful events – The Preferred Place…The Preferred Partner….The Preferred Provider. We are a Customer Led venue that offer our flexibility, our size and the integration of our facilities and services to deliver one stop and total solutions to our customers, with an array of professional and valued added services ranging from floor space consultations, event management, operations, F&B catering, travel and logistic to even sales and marketing. Our company’s “Partnership for Success” culture is based on delivering high value to our partners and customers through mutual trust, cooperation, strategic partnerships, customized and turn- key solutions. Our customers see us as a trusted partner who works closely with them to ensure the success of their events.